The Media Design Experimental Publishing Master course (XPUB) of the Piet Zwart Institute, Manetta Berends & Cristina Cochior (Varia) and the WORM Pirate Bay invite you for an evening of book scanning, short presentations, discussions and software experiments in the context of text digitisation and processing. The term OuNuPo is derived from OuLiPo (Ouvroir de littérature potentielle), founded in 1960. OuLiPo is a mostly French speaking gathering of writers and mathematicians interested in constrained writing techniques. Notable members were Georges Perec and Harry Mathews. One of the notable techniques used by the group is the lipogram; which generates texts where one or more letters have been excluded. OuLiPo eventually led to OuXPo to expand these creative constraints to other practices (OuCiPo for film making, OuPeinPo for painting, etc.). In the same spirit, XPUB launches OuNuPo, Ouvroir de Numérisation Potentielle, the workshop of potential digitisation, turning the book scanner as a platform for media design and publishing experiments. OuNuPo has been employed as a means to reflect on several topics such as: how culture is shaped by book scanning? Who has access and who is excluded from digital culture? How free software and open source hardware have bootstrapped a new culture of librarians? What happens to text when it becomes data that can be transformed, manipulated and analysed *ad nauseam*? 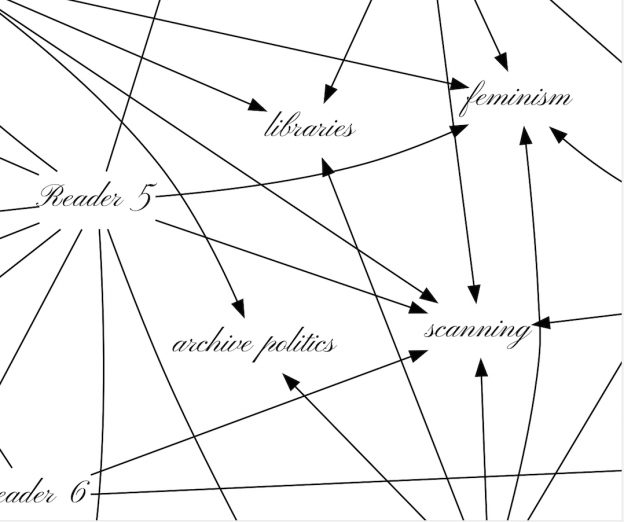 To answer these questions, the XPUB team have written software and assembled a unique printed reader, informed by critical and feminist research methodologies and that explore the themes of the digital transfer of cultural biases, Techno/Cyber/Xeno-Feminism, orality in the context of knowledge sharing, shadow libraries, database narratives, gender and future librarians. The content of the reader will be scanned by a DIY book scanner built in the past months, and processed by different software processes and performances written by the XPUB practitioners, from chat bots to concrete poetry generators and speech recognition feedback loops.